A haze descends on Yosemite, farmers block the Tour de France, wildfires rage in Greece and more. 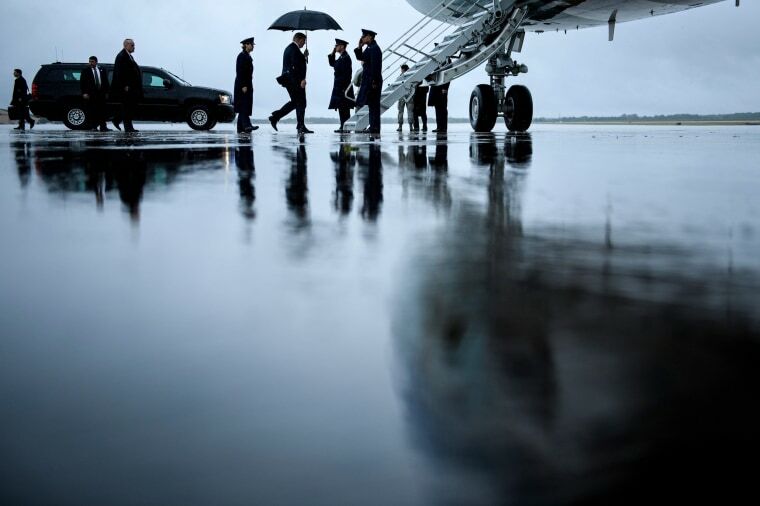 President Donald Trump boards Air Force One at Andrews Air Force Base on July 24 in Maryland. 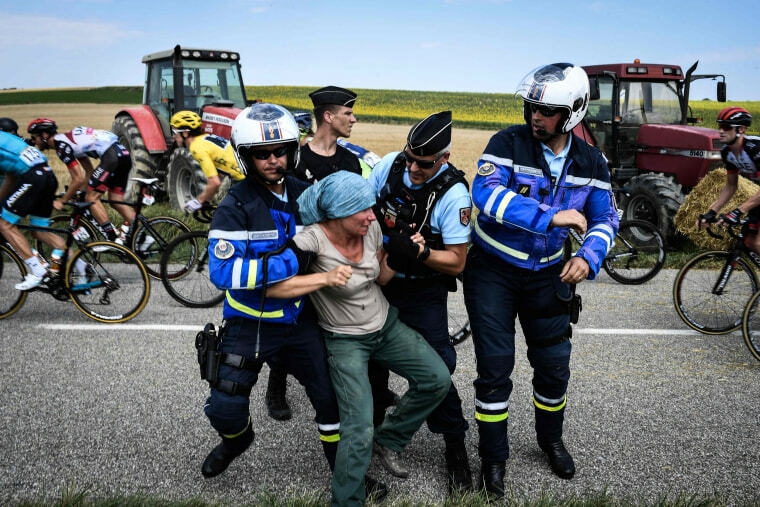 Gendarmes detain a protester as Great Britain's Geraint Thomas, wearing the overall leader's yellow jersey, rides behind during the 16th stage of the Tour de France on July 24. The race was halted for several minutes when police used tear gas to disperse a farmers' protest that had blocked the road with bales of hay. The farmers were protesting a planned reduction of European Union funding. 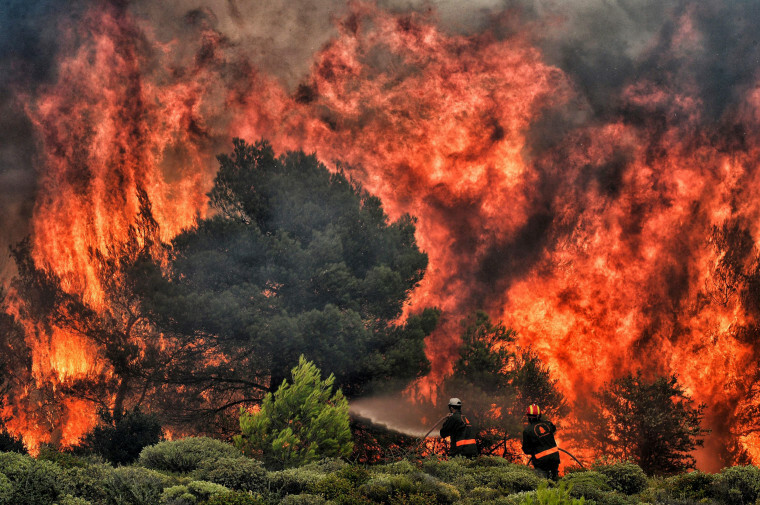 Firefighters try to extinguish the flames of a wildfire in Kineta, Greece, on July 24. Raging wildfires in Greece killed at least 82 people, including small children, devouring homes and forests as terrified residents fled to the sea to escape the flames. 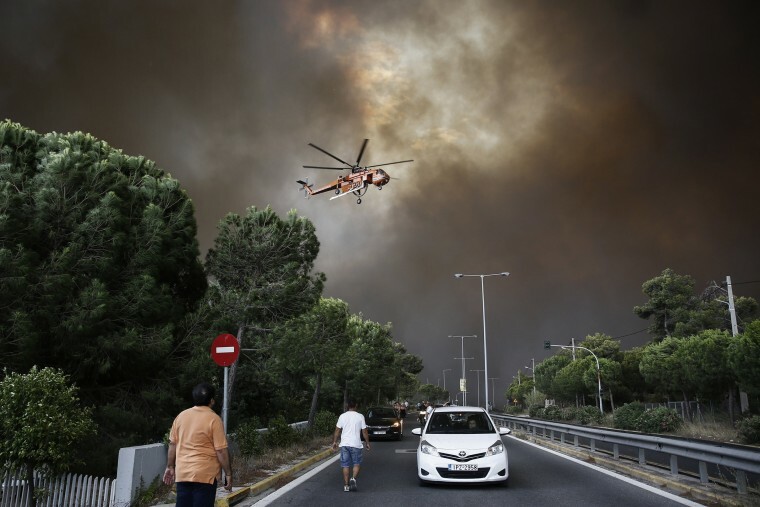 A firefighting helicopter flies over Neo Voutsa, a northeast suburb of Athens, on July 23. 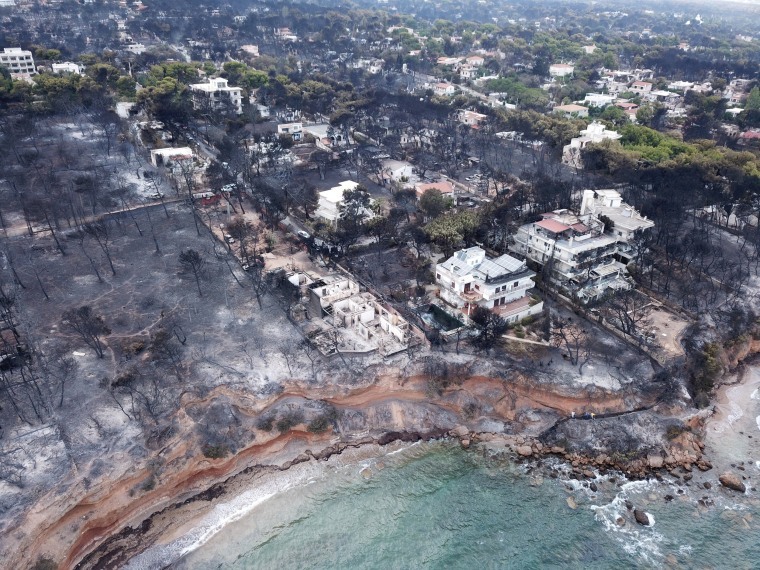 Fanned by gale-force winds, a wildfire raced through seaside resorts of full-time homes and vacation residences popular with Athenians and tourists. 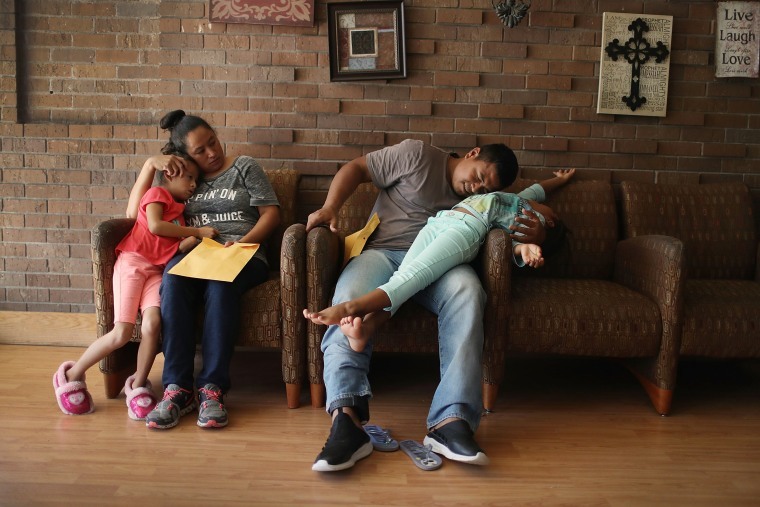 Heydi and her daughter, Mishel, 6, and Luis and his daughter, Selena, 6, relax together in an Annunciation House facility after they were reunited with their children on July 26 in El Paso, Texas. 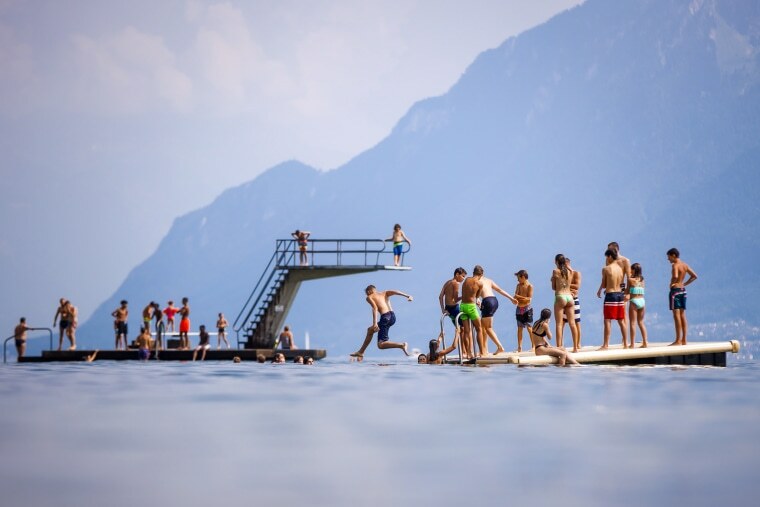 Heydi, from Guatemala, and Luis, from El Salvador, were reunited at an Immigration and Customs Enforcement processing center about two months after they were separated when they tried to cross into the U.S.
Swimmers enjoy the weather on a diving platform on the shore of Lake Geneva, in Lutry, Switzerland, on July 25. Like much of Europe, the Alpine nation has been experiencing unusually hot and dry weather in recent months. 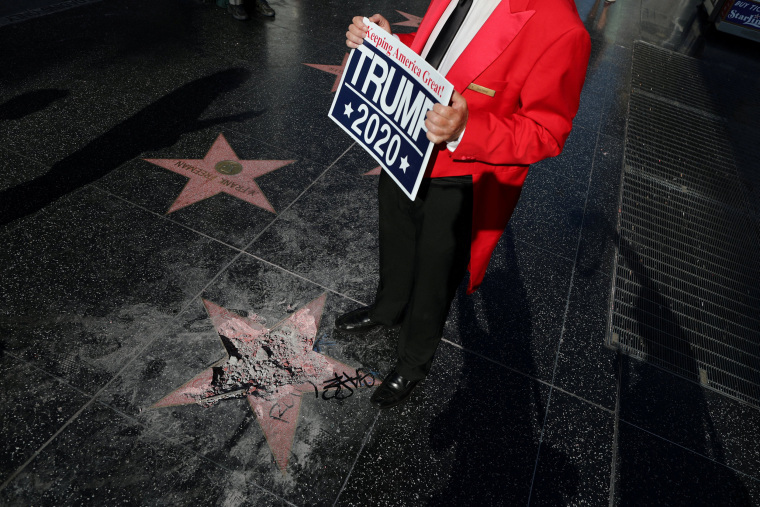 Trump supporter Greg Donovan, 58, stands on Donald Trump's vandalized star on the Hollywood Walk of Fame on July 25. 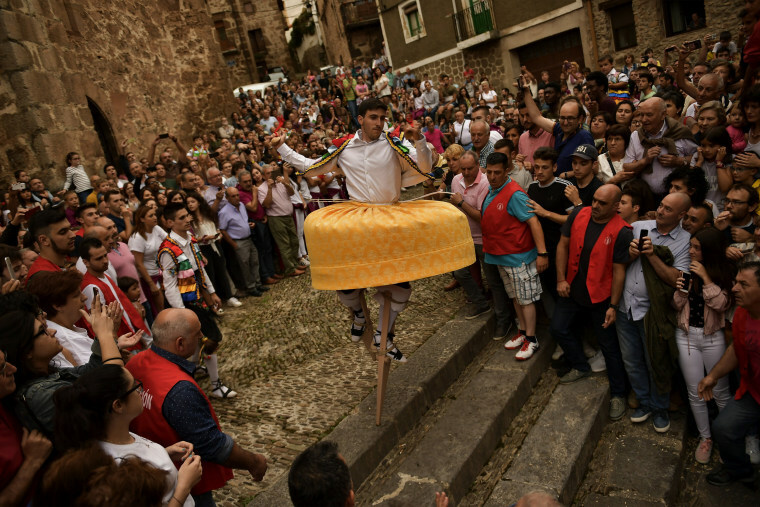 A dancer performs the "Dance of the Stilts" in honor of Saint Mary Magdalene in Anguiano, Spain, on July 21. In a tradition that dates back more than four centuries, eight young people from the town balance on stilts down the old street, turning to the sound of folk music played on a pipe and drum. 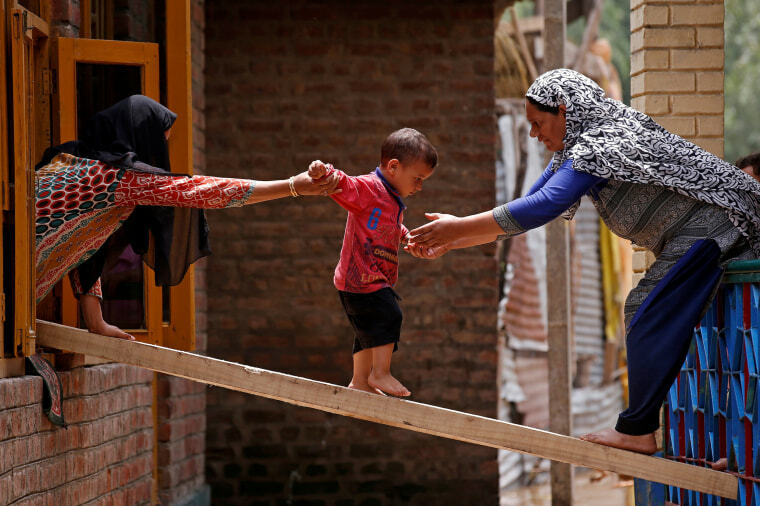 Women help a child cross over to another house on a wooden plank after flash floods in Tailbal, on the outskirts of Srinagar, in Indian Kashmir, on July 24. 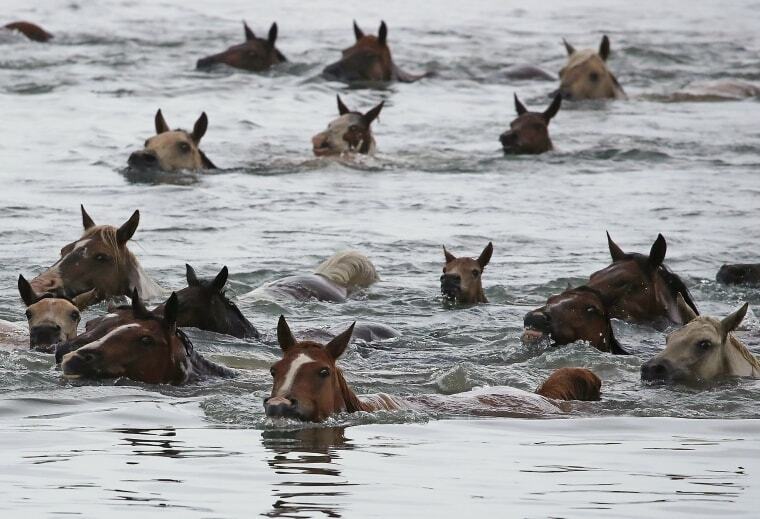 Wild ponies swim across the Assateague Channel during the annual Pony Swim from Assateague Island to Chincoteague, Virginia, on July 25. Every year the wild ponies are rounded up on the national wildlife refuge to be auctioned off by the Chincoteague Volunteer Fire Company. The first foal to come ashore is named King or Queen Neptune. 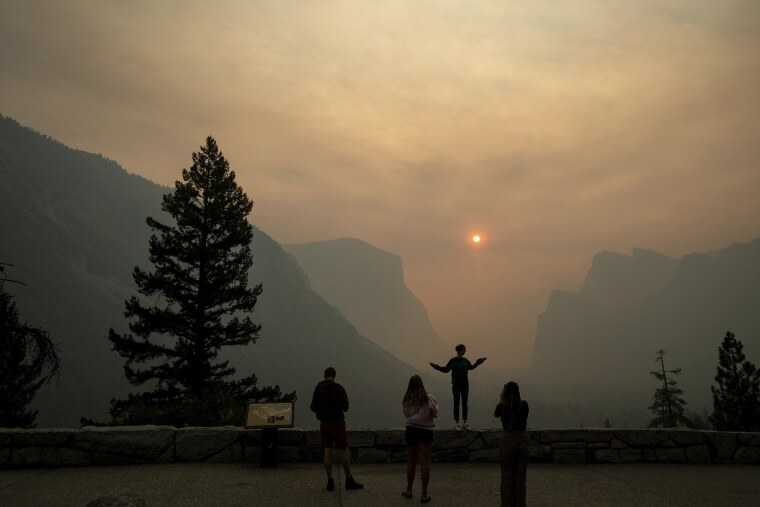 Hannah Whyatt poses for a friend's photo as smoke from the Ferguson fire fills Yosemite Valley on July 25 in Yosemite National Park in California. 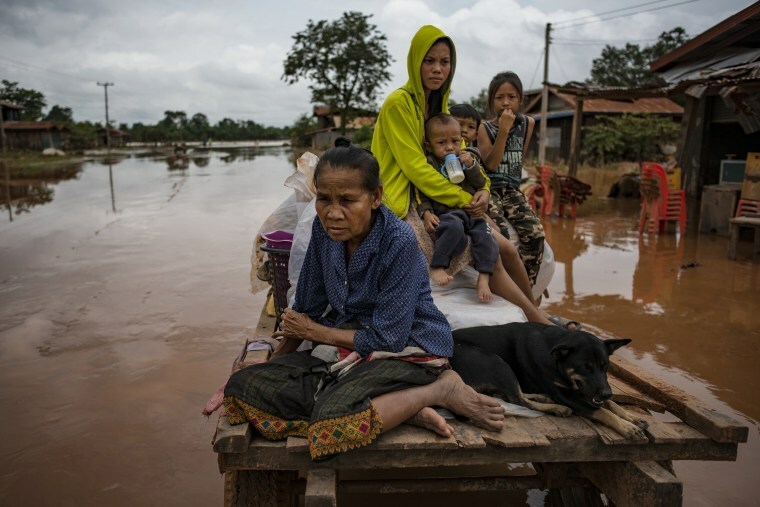 Residents evacuate to safer grounds on July 26 after flash floods engulfed their villages in Attepeu, Laos. At least 27 people were killed and 131 remain missing after part of a newly built dam broke in southeastern part of the country. 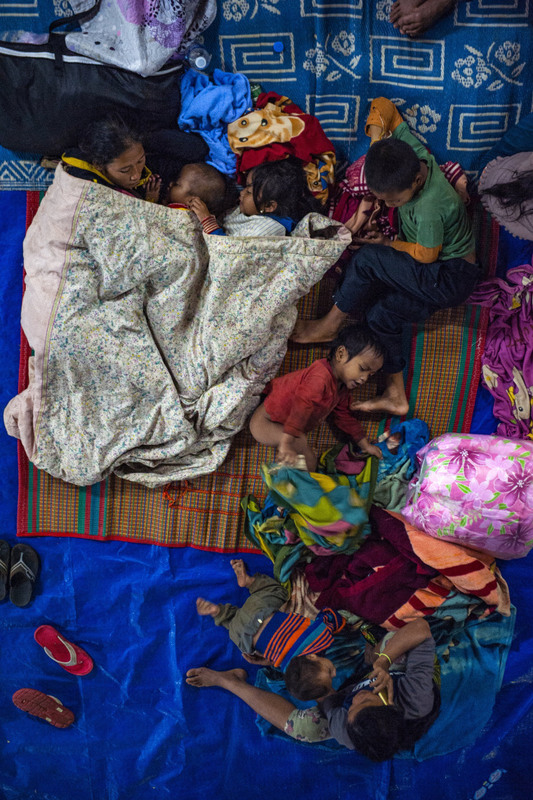 Villagers take refuge in a makeshift evacuation center after they escaped the fast rising waters after a dam collapsed in Champasak, Laos, on July 24. A man holds his handmade Tezutsu hanabi, or handheld firework, dedicated to the Yoshida Shrine a part of a Shinto ritual, on the eve of the Toyohashi Gion festival, in Toyohashi, Japan, on July 20. 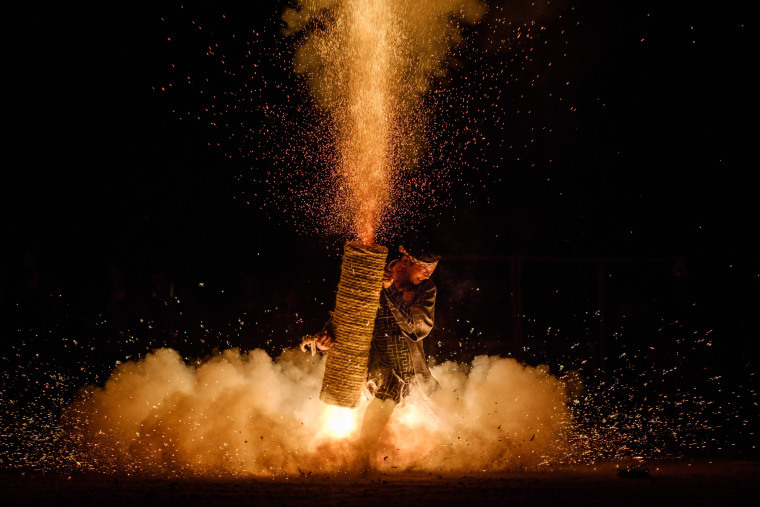 Every year, each male member of the shrine makes his own set of fireworks from bamboo covered by straw ropes with a loaded gun and metal powder, in a tradition that has been practiced for more than 350 years, according to an old document at the shrine. 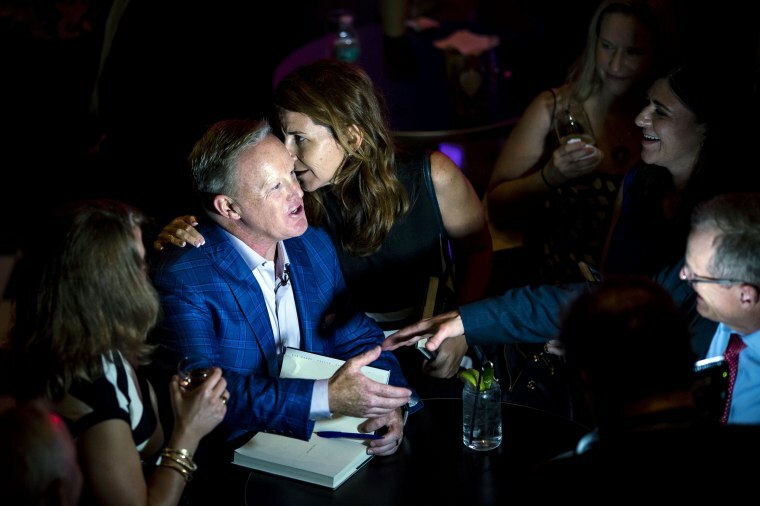 Former White House Press Secretary Sean Spicer greets guests as he signs a copy of his new book at a launch party in Washington on July 24. People watch a wildfire in the town of Rafina, Greece, on July 23. Greek Prime Minister Alexis Tsipras declared a 3-day national mourning period for dozens killed by wildfires near Athens. 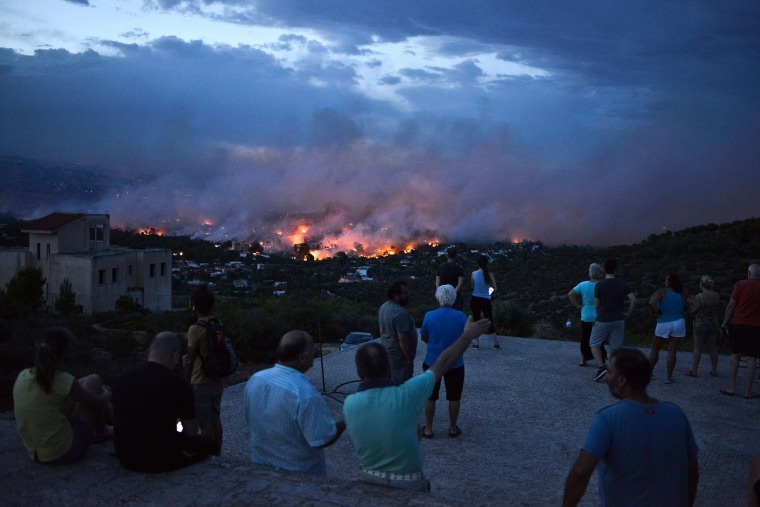 A neighborhood devastated after a wildfire in Mati, Greece, on July 24. During the fire, hundreds fled to nearby beaches, with many swimming out to sea to escape the ferocious flames and choking smoke. Coast guard and volunteer divers were searching the waters off the coast. 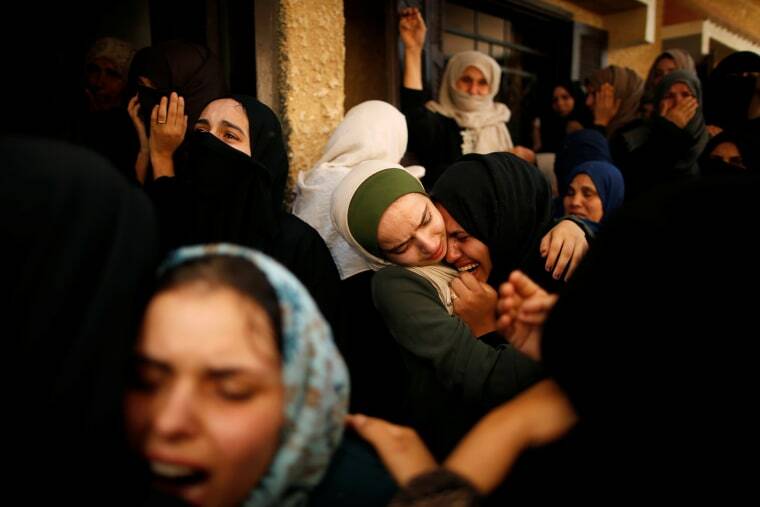 Relatives of a Palestinian militant killed in an Israeli strike mourn during his funeral in Khan Younis in the Gaza Strip on July 21. Gaza's militant Hamas rulers said Saturday they had accepted a cease-fire ending a massive Israeli onslaught on militant positions after a soldier was shot dead, once again pulling the sides back from the brink of a full-fledged war. 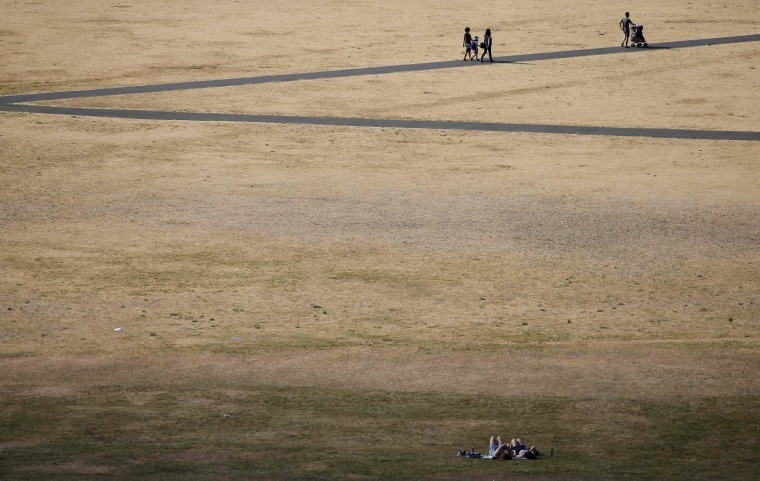 Visitors walk along footpaths surrounded by dry brown grass in London's Greenwich Park on July 23. Many parts of the country have seen no rainfall for weeks. London issued a high pollution alert, and fire officials called for a ban on barbecues in parks. 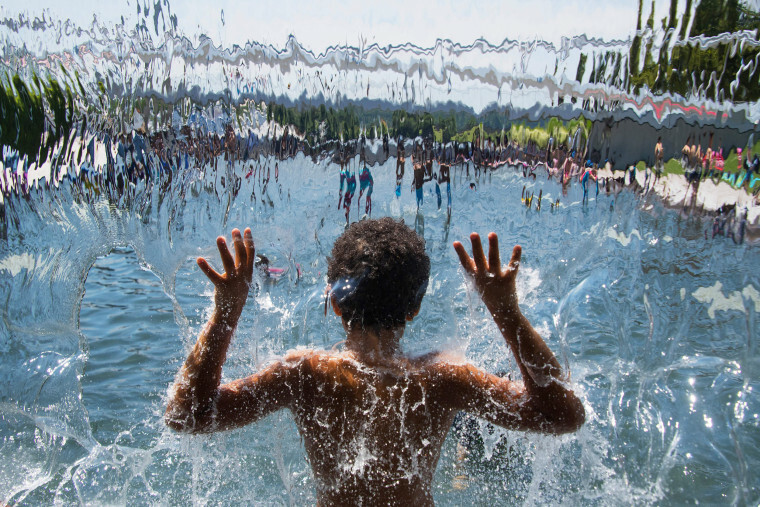 A child plays in the waterfall at Yards Park in Washington on July 19.